Or: how Japan learned to stop worrying and love the bomb. 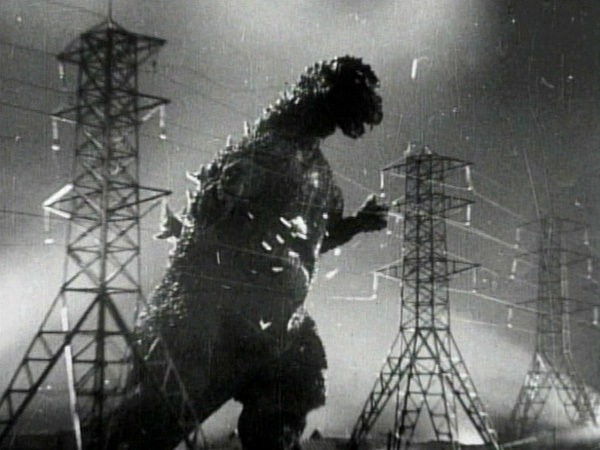 Restored, recut and re-released with a full 40 extra minutes to celebrate a 50th birthday, Godzilla shrugs off its politically neutered US edit to stomp tall once more: a thirty-storey atomic metaphor as urgent, fraught and ambiguous as ever. Actually, as the DVD’s featurette Designing Godzilla reveals, that national icon is really a sweaty man in a rubber suit with what look suspiciously like Christmas trees glued to his back. But then, Godzilla is a movie crackling with mutant fusions – from ancient folklore crunched with modern monster madness to terrifying, newsy realism shouldering up against wobbly effects. But if those “suit-mation” techniques clunk and jolt next to King Kong’s bristling stop-motion, there’s no swerving Godzilla’s searing apocalyptic impact. Kicked off the Pacific seabed by a nuclear blast, the mega-ton sea monster unleashes his appetite for mass destruction on Japan with elemental force. Belching radioactive breath, tearing through electrical grids, smashing skyscrapers, Godzilla turns civilisation into a city on fire. While Seven Samurai uber-thesp Takashi Shimura and scientist Akihito Hirata agonise over whether to risk another secret superweapon to destroy the monster, the movie chokes up with panicked references to nuclear contamination, black rain, bomb chaos, blazing infernos and twisted metal. And, rewarding his apprenticeship to Kurosawa, director Ishiro Hondo keeps human drama pounding hard at the heart of Japan’s first big-budget blockbuster: the nuked children, the babies wailing as their mothers lie dead, the ragged bodies oozing blood… Unspooling less than a decade after America’s obliteration of Hiroshima, Nagasaki and Tokyo, these images would have rattled viewers to the core. Easy to forget that for Japan, nuclear apocalypse is less sci-fi nightmare than bitter memory. Indeed, Godzilla’s opening scene – a Japanese fishing boat drowning in an ocean of flame – is a moment mainlined direct from history. On the DVD, a 10-minute vintage featurette reveals desolate footage of post-attack Japan as it pays dues to the US H-bomb test that contaminated 23 fisherman. There are two more short-but-fascinating featurettes devoted to the monster’s creation (the look was apparently inspired by a children’s book of dinosaurs) and the story’s evolution (detailing several unfilmed scenes), both packing priceless Making Of stills. On the commentary, three US Godzilla buffs give a comprehensive talk-through of the monster, the movie, the Making Of and the mythologies, plus there’s the chance to make a revealing compare-and-contrast between the Japanese trailer (“Special effects surpassing American films!”) and the risible US promo (“Wiping out six million in a holocaust of flame!”). Surviving half a century, 22 mad sequels and Roland Emmerich’s reptile-to-turkey devolution, the Lizard’s scorched warning continues resonate, now finding new rhythm in the tremors of a post-9/11 world. In short? As an awesome big brother to Hiroshima Mon Amour and Dr Strangelove, Big G is still the bomb.